HomeThis Sunday: Mass protest in Ottawa against immigration detention. Here’s why. This Sunday: Mass protest in Ottawa against immigration detention. Here’s why. My favourite activity many mornings is bringing my nine-year-old to school. He talks on and on mainly about minecraft and dungeons and dragons, holds my hand and gives me a big hug when we get to his school. Hundreds of mothers, fathers and other caregivers being held behind bars by Canada Border Services Agency do not get to drop off their children in the morning, and Canada uses a broken and defective detention review system to justify this tragedy. Most western nations have a “presumptive period” — a period a person can be held to effect removal after which they usually must be released if removal has not been effected. The U.S. has a 90 day period, the European Union has a six month period and the United Nations High Commission for Human Rights Working Group on Arbitrary Detentions has said every country should have a presumptive period. Canada has no such period. Canada is a rogue nation. The Courts created a loophole, justifying the lack of a presumptive period by finding that having a robust and regular review of detention means that despite the lack of a presumptive period, immigration detention in Canada cannot be considered indefinite and hence in abrogation of the Canadian Charter of Rights and Freedoms. So, in Canada, immigration detentions are reviewed every month — called a “detention review.” This means that the detainee’s release depends on a decision by a single individual. In the last week, the End Immigration Detention Network released a startling and revealing report throwing extreme doubt on the robust nature of these detention reviews. This report, based on Access to Information Requests and reviewed by two professors and two legal professionals, showed that in 2013, immigration detainees spent 504 years in detention in total, including the detention of 196-807 children each year. This was at a cost of $120-207 a day if the person was held in a provincial facility. Despite the existence of three dedicated minimum security immigration facilities, people are often held in maximum security provincial and federal facilities. However, the most startling figures revealed were with regards to the Detention Reviews themselves. So basically, being released is entirely dependent on where you are being held, who happens to preside over your hearing that morning and how long you have been held. What’s going on with the system? I am an Immigration Consultant with the law firm Carranza LLP, and a member of the Immigration Legal Committee, which is a joint committee of No One Is Illegal Toronto and the Law Union of Ontario. I am active in the End Immigration Detention Network, which was formed after 191 immigrant detainees went on hunger strike last fall in the Central East Correctional Centre to demand that they be removed or released. I have colleagues who practice immigration law in Montreal and Vancouver. They describe a detention review process, which is very different than the one my clients experience. They describe hearings where the Minister of Public Safety and Emergency Preparedness has to show why detention should continue. Not so in Toronto, where clients complain of being treated like bad children, told by Board Members that the Member is going to stick to the last decision when they decide to continue their detention. In fact, the only directive we received when we asked for all directives to Board Members from National Headquarters was a memo asking that Board Members write their decisions in such a way as to not just copy the last decision. Discussions amongst the immigration bar and the figures in the report themselves seem to indicate political interference with the process. No one but Minister of Public Safety and Emergency Preparedness Steven Blaney and Stephen Harper can tell for sure, but they’re not talking. I remember one detainee talking about how his son comes home every night, sees his dad’s shoes and asks when daddy is coming home. I know Michael Mvogo’s church is asking when he will come to help preach gospel because he’s been held for almost eight years. I know many other families, communities, synagogues, mosques, churches, temples, community organizations and communities are wondering when their people will come home. Detainees at the Central East Correctional Centre, in Lindsay Ontario, Central North Correctional Centre, in Pentanguishene Ontario, and the Toronto West Detention Centre have had enough. 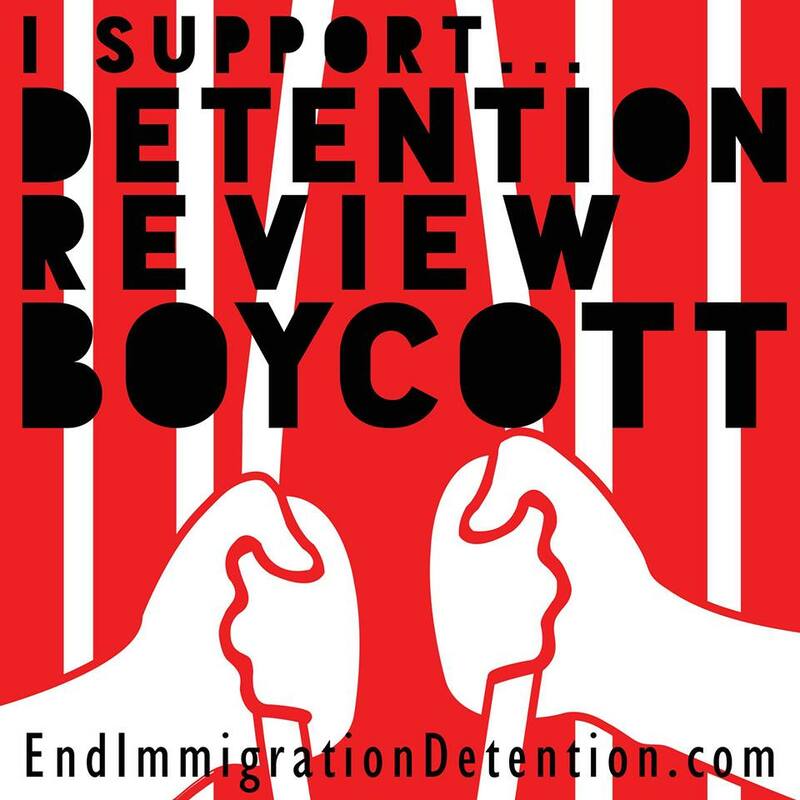 They are tired of what they term “sham detention reviews” and are boycotting their hearings this month. The report was released this week, and showcased in major media like Toronto Star and on CBC’s Morning Edition and independent media. A massive demonstration is planned for this weekend in Ottawa as part of the International Coalition on Penal Abolition conference there. A petition is before the United Nations to ask the UN to tell Canada to set a presumptive period. Blaney and Harper remain silent, refusing to admit that their laws have created a rogue system in a rogue country. But detainees and their supporters are not remaining silent. We will get the mothers, caregivers, fathers, lovers, colleagues, community members home. Join us! For more information on the Ottawa Convergence to End Immigration Detention event, click here. For more information, check out Truth About Detention, End Immigration Detention andNo One Is Illegal. Mac Scott is an Immigration Consultant at Carranza LLP and organizes with No One Is Illegal Toronto and is part of the End Immigration Detention Network.